The diversity of Indiana’s eco-systems makes it home to assorted tree species, including many deciduous trees. Native flowering trees grow throughout Indiana with a higher concentration in the southern half of the state. The trees enhance Indiana’s natural landscape with color. The flowering trees of Indiana provide food for wildlife, attract beneficial insects, and have use in wood production. The flowering dogwood (Cornus florida) gives a brilliant display with its abundant blooms. Small, yellow flowers surrounded by white bract--petal-like structure--adorn the tree in May. It grows in sun or partial shade. The flowering dogwood reaches heights up to 25 feet. The understory tree grows slowly. At least 36 different species of birds, as well as forest mammals, rely on the dogwood for food. They eat the red fruit the tree produces, although it contains substances that are poisonous to people. The flowering dogwood has a relatively short life for a tree, living to around 125 years. It is susceptible to drought, and requires a protected site to survive Zone 5 winters. Black cherry trees (Prunus serotina) also attract wildlife. The black cherry blooms prolifically in May, and produces small, edible dark red-black cherries in the fall. 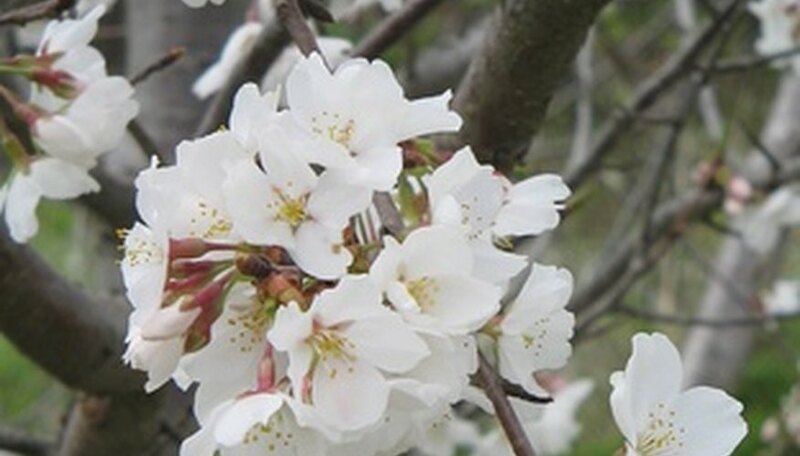 Its white flowers cover the tree and perfume the area, attracting numerous pollinators. The tree grows in nearly any conditions, even tolerating dry soil and some shade, but performs best in full sun and cool areas with moist soil. Black cherry trees flourish through Zone 3. They have a medium rate of growth and reach up to 50 feet tall. One of the earliest trees to flower, the redbud (Cercis canadensis) blooms in early May. The purple-pink flowers form before the leaves and, in Indiana, require at least 30 days of temperatures above 50 F before opening. The flowers provide food for honeybees, and the seeds are a source of winter food for birds and squirrels. The redbud tolerates shady or sunny locations. They thrive in well-drained, moist soil. The tree reaches 15 to 25 feet with a medium growth rate. Indiana’s state tree, the tulip poplar (Liriodendron tulipifera) has distinct, easily recognizable flowers that appear from April until June. The tulip-shaped flowers variegate from green tips, to yellow petals with orange centers. The tree begins flowering at around age 15, and continues production to approximately 200 years. Tulip poplars grow quickly to 70 feet, making them one of the tallest hardwood varieties of the eastern Unites States. The tulip poplar has several uses: it provides shade, wood for furniture and food for animals and honeybees. The tree performs optimally in moist, fertile and well-drained soil through Zone 4. Tulip poplars require full sun.